When did you join the company and what is your job title? I joined the business in November 2016 as the Health and Safety Business Partner for Salt and Sodium Bicarbonate. What does your current role involve? Do you have a team working for you? My current role involves the day to day management of health and safety across Lostock Soda Ash which is where I’ve been seconded recently. Previously I was responsible for the health and safety at Winnington Sodium Bicarbonate, Lostock Sodium Bicarbonate, Lostock Crex, Middlewich Salt and I even got out to Irish Feeds once in a while! I’m involved in all sorts of things like inductions, PPE trials, audits and investigations. I always say that no two days are the same in my role. I end up doing a variety of tasks depending on what is the most pressing issue at that moment in time. I’ve no team working for me but everyone knows safety is our number one priority so are very happy to help. Where did you work previously and what got you into health & safety? I worked for an Industrial Cleaning contractor previously again in a Health and Safety role. 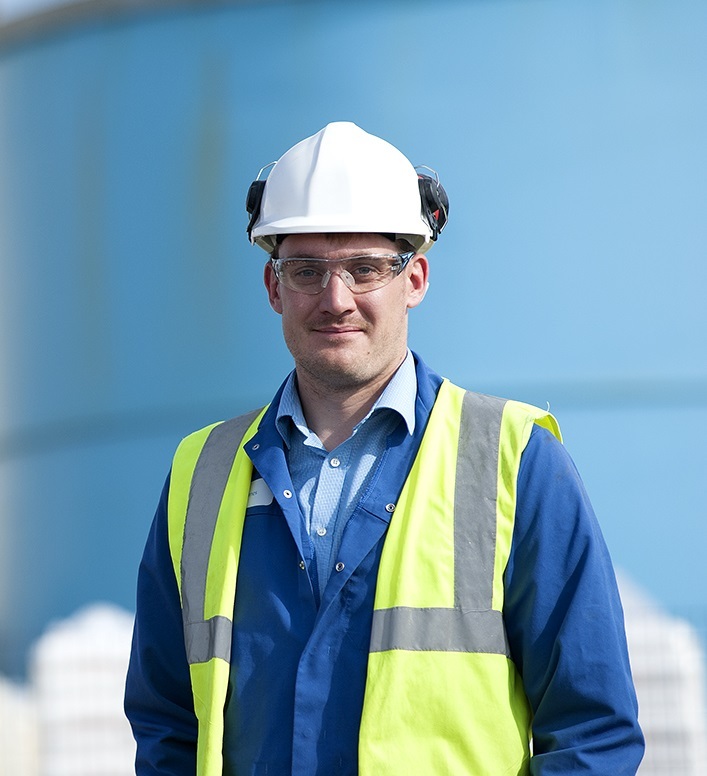 I’ve always worked within compliance roles and started out as an Environmental Support Officer, after a few years at that I got the opportunity to complete a Health and Safety qualification and took it. The rest as they say is history and I’ve been in SHE roles ever since. What have been the key initiatives that you’re currently involved in? Some of the key ones that people will be seeing from the start of 2019 is the Golden Rules rollout. The aim is to provide a key set of safety guidelines to help everyone on our sites to work better. We’ve got some exciting ideas that we are going to be trying in order to get everyone involved with this. We understand that you make H&S interesting and get people engaged in this topic. What’s your approach to this tricky area? Health and Safety often gets a bad reputation as the ‘fun police’. We’re seen as stopping jobs from being completed the same way they have been for years or imposing some overly strict rule. A lot of the time being safe at work is a lot more to do with attitude rather than rules. It’s about thinking before acting and I try and make sure messages are delivered in the best way that they can. I’m never afraid to try new things – sometimes they work and sometimes they don’t! Talking with individuals completing tasks and understanding the things which affect them is crucial. Plus getting everyone comfortable with the safety team has been essential to get better engagement. No one will make you aware of safety concerns if they don’t know who you are! My biggest achievement has been seeing each one of my sites achieve 365 days without a lost time accident and (fingers crossed) by April 2019 [at time of writing we are at 584 days without a lost time accident] we will be celebrating 2 years without a lost time accident at the Winnington Sodium Bicarbonate plant – a fantastic achievement and one not equalled in the business to date. Equally well all our accidents are showing a decreasing trend which means less people are getting hurt at work. I say this is my biggest achievement but, like everything in safety, it has been a real team effort so thank you to all who have worked hard to achieve this. I also won the EU Salt Safety Award 2018 for a project we ran involving the use of 360 degree video of a number of staged hazards within the warehouse at Middlewich. We used this footage during training days to drive engagement and I’m pleased to say it’s worked! What gives you the most job satisfaction in your H&S work at TCE? My biggest job satisfaction is having incident free days. When we have incident free days, which is almost daily I hasten to add, then I’m satisfied that everyone has gone home to their families in one piece. It means everything has gone well and everyone has acted and behaved in a responsible way. We understand that you wanted to mention the work of your colleague Dan Sturman – what would you like us to include here? I think it’s important to understand that safety is a team effort without the buy in and engagement of everyone then both Dan and I are fighting a losing battle. Dan and I work well together bouncing ideas off one another and when there are big projects to be undertaken such as inductions then we divide up the work to make it easier for both of us or more efficient for the business. Tell us a little about your involvement as a mental health first aider? I’ve had experience with mental health issues both personally and with my loved ones and it’s something which I think still has a huge stigma attached to it particularly in the manufacturing sector. I was offered the opportunity to become a mental health first aider with TCE and readily accepted. I see people day in day out who are potentially suffering from mental health issues but are unclear on where to go to get help. TCE as a business are putting a lot of time in to developing the wellbeing hub and ensuring that everyone knows there are mental health first aiders available should anyone want to speak to one.